Article original published in the Connacht Tribune, June 29th, 2018. 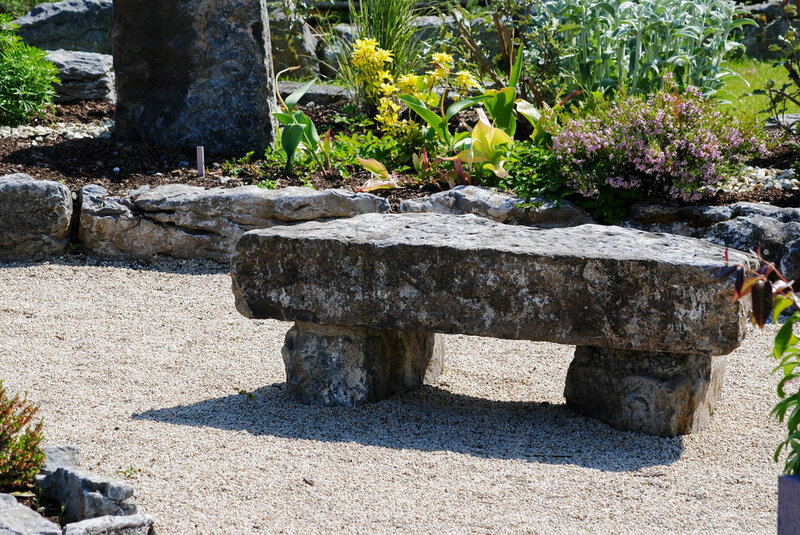 This stunning garden brings together Irish mythology and sensory design to create a healing environment for visitors to the 5 * SCCUL Sanctuary, a therapeutic retreat centre in Clarinbridge, Galway. 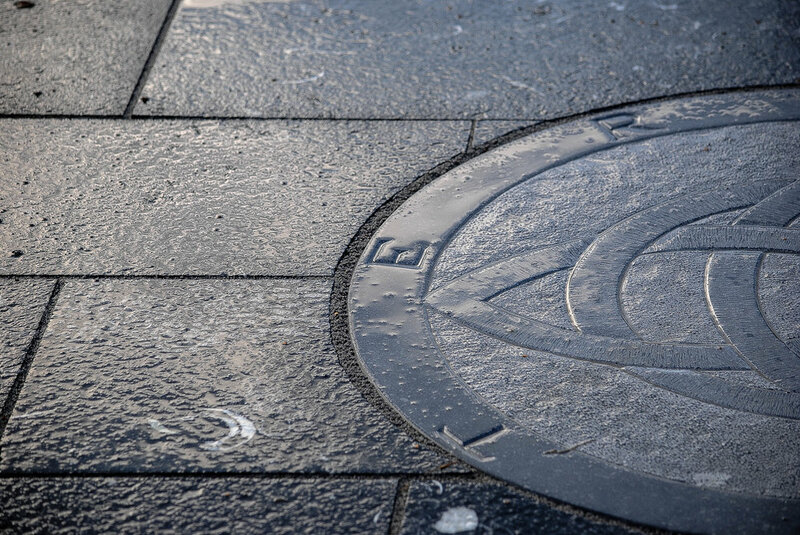 With three themes: sensory, spiritual and sustainability, each element of this special garden is crafted with care and precision by Mike Walsh & the team from Claddagh Designs. It is an oasis of calm and sensory pleasure. Garden Enthusiasts: Paralympian Mark Rohan and SCCUL CEO Michael Smyth. With the desire to make the area wheelchair accessible, the SCCUL team were ‘blown away’ by the design that landscaper, Mike Walsh, came up with. Teasing out the original design. Sensory garden: taste, touch, smell, hearing and sight. Mike’s dedication and talent is evident to all by the intricate woven hazel fence that surrounds the garden. This piece of art acts as a frame without taking away from the feel of the indigenous forest grounds. 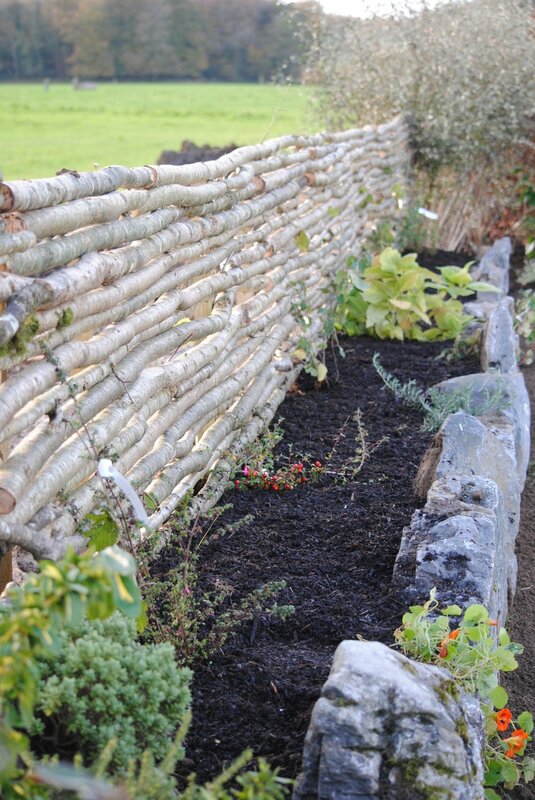 Using natural materials means that there is a sense of continuity within the area, rather than a fence representing a divide or enclosure. This design achieves a sense of feeling safe within the garden, while at the same time opening up possibility as you engage with the larger more expansive landscape. From larger scenic vistas to minute detail, it is possible to journey around this little sensory oasis, rub your hands over herbs and flowers and let the smell of organic lavender, mint or fennel lift your spirit. There is something remarkable about the design of this garden. It really enables visitors to become absorbed and experience the present. Only 6 months on and flowers are blooming. Importantly, the height of each flower and herb bed is designed with thought for people using wheelchairs or with mobility challenges. It is possible to be seated and still reach over and touch or smell the scent of the rose petals, or crushed soft green sage. Although each flowerbed is separate, they are designed with curves and circles to represent the symbol of eternity, continuity and togetherness. This little garden, in all its simplicity, is not big. But, in conjunction with SCCUL’s team of therapists and workshop facilitators, it has enormous potential to touch people’s lives and restore a sense hope and meaning in a world that can sometimes feel isolating and hope-less. There is a lovely sense of evolution to the SCCUL Sanctuary garden. You are compelled naturally to follow the pathway from the senses toward the spiritual space within the garden called the symbol of eternity. And it is here that Mike’s work takes on a breath-taking dimension. This arresting stone setting is inspired by ancient Celtic design and Mike’s company logo. It represents eternity: no beginning, and no end. 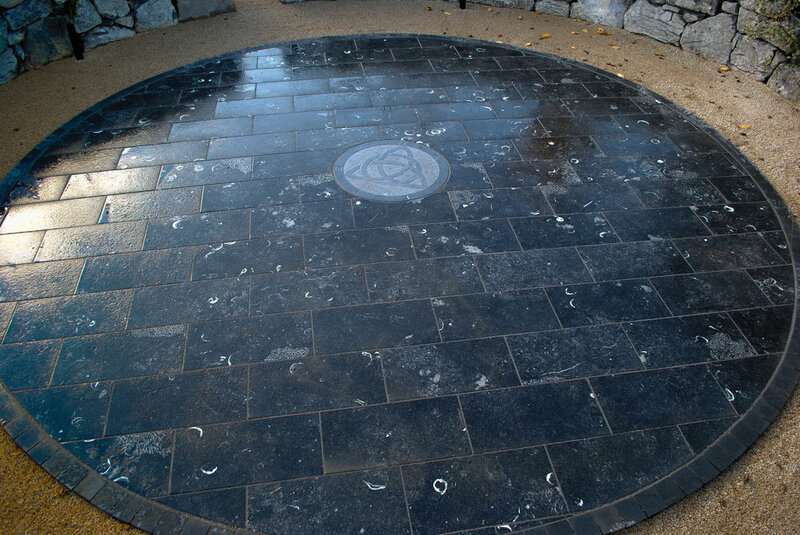 Together with Master Stone Carver, Ray Flaherty from Galway Salvage, Mike created this awe-inspiring central art piece that is surrounded by a round rugged traditional stone-wall. SCCUL’s passionate team (including Noirin Ni Chonaola, Interior Designer and Matt Whelan) wanted to have somewhere for outdoor meditation. Trish explains how they originally picked a smooth limestone so that on damp spring mornings the stone would dry quickly and enable them to have groups outdoors for yoga or meditation. “Mike, however, sourced for us something even better. It is an exceptional focalized crystal embedded limestone, and there is a real sense of being connected to the earth and antiquity through this stone. Limestone symbol with ancient fossils. Mike explains that his company’s “authentic design brings alive Irish history & traditional culture into contemporary spaces. We take time sourcing local stone and organic materials. Everything we create has it’s own story and history and is crafted with care and precision. I was delighted to be invited to work with SCCUL Sanctuary, as it gave us an opportunity to really showcase our design expertise, within such a beautiful and worthwhile project. Finishing off the building of the natural stone wall feature. The garden would not be complete without a reflective memorial seat that sits naturally in the presence of grace just North of the circle of eternity. When reflecting upon the whole process Trisha recounts how fantastic Mike was to work with. “This was our first time doing anything like this. Mike had such great ideas; he really listened and took time to develop our plans with us. His dedication was second to none! Nothing was too much trouble, he was really patient, offering gentle guidance when we were not sure of our way, and suggested changes very sensitively,” laughed Trisha. He also worked extremely hard to finish in what could be described as terrible weather conditions. He worked relentlessly through rain and wind, and had wonderful recommendations for shrubs and trees that reflected the natural woodland habitat that surrounds the Sanctuary. SCCUL Sanctuary are now working on a sustainable and youth garden with raised bed, with the hope that young people can come and plant herbs and veggies and the organic produce used for cookery and nutrition classes for different groups within the locality. “Mike has started this for us, but we are in the process of attempting to raise funds for its completion. 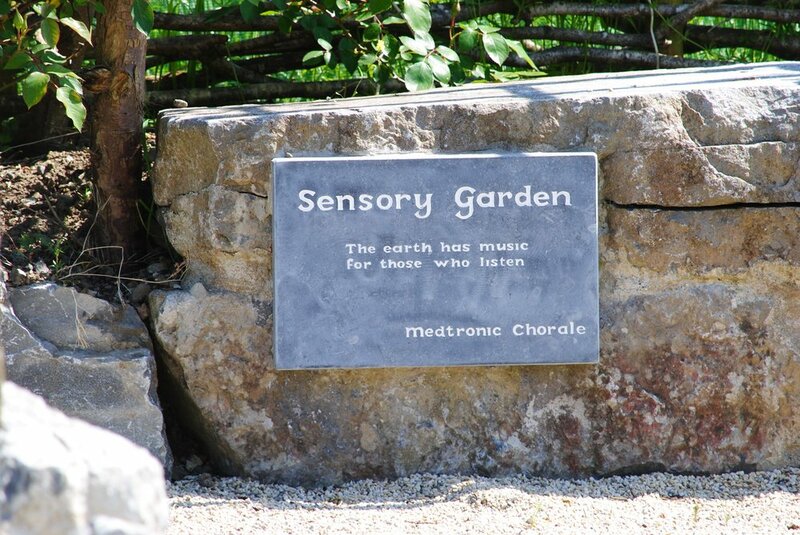 Our sponsors for the first phase of the garden include Medtronic Chorale, Galway County Council, Flag West and Alkermes Athlone and we are now currently inviting continued support for the next phase of our little garden and we look forward to sharing these new developments with you.” Trisha & Annette.